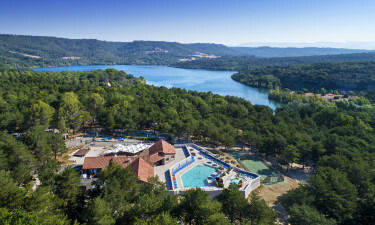 La Farigoulette is a luxury camping site located right by a beautiful lake on the river Verdon. Right by the Alpes de Haute Provence, this protected natural area is a nature-lover's dream, providing many opportunities for outdoor activities and beautiful walks among the flora and fauna. Your comfortable mobile home will provide the best spot to relax and watch campsite life pass by, with a huge range of fun activities on offer and useful amenities such as a restaurant. La Farigoulette is a wonderful destination for a camping holiday, thanks to the picturesque setting and family-friendly feel. In an area renowned for its outdoor lifestyle and great weather, visiting this LuxCamp is a must. Why choose Camping La Farigoulette? La Farigoulette is a once-in-a-lifetime luxury camping experience, filled with fun for both kids and adults. Kids will never tire of the exciting water playground, with slides and activities. The pool is heated and offers water aerobics classes for fitness fanatics. La Farigoulette was built right on the lake, which is just a few minutes walk from the heart of the campsite. 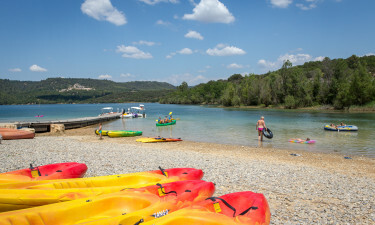 It has its own pretty pebble beach, which is a base for canoeing, boating, and paddleboarding.